This is a Maharashtrian delicacy which I had at my sister’s place a couple of times. 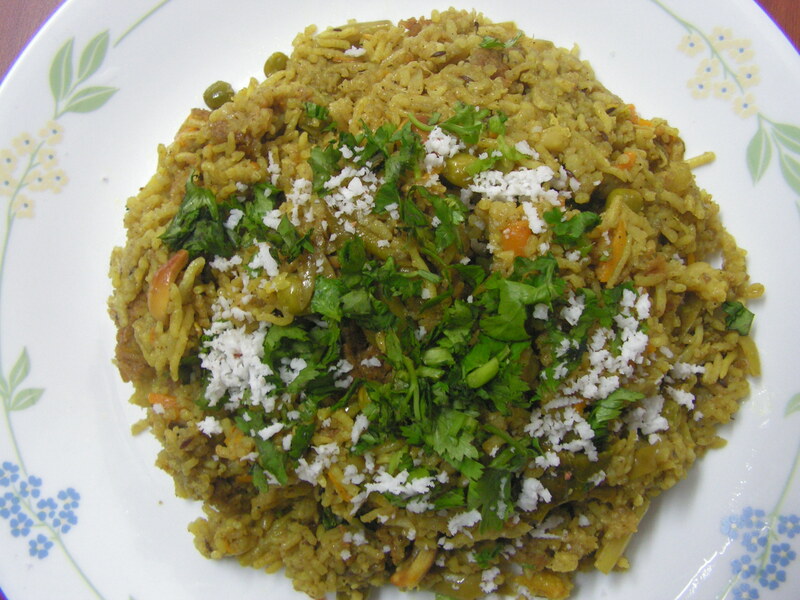 It is ideal when you don’t feel like preparing 3 different items – rice, dal and curry. It can be a healthy one pot meal if you adjust the proportion to make it more vegetables/dal and less rice. Have it plain or with tomato/onion salad. 1. 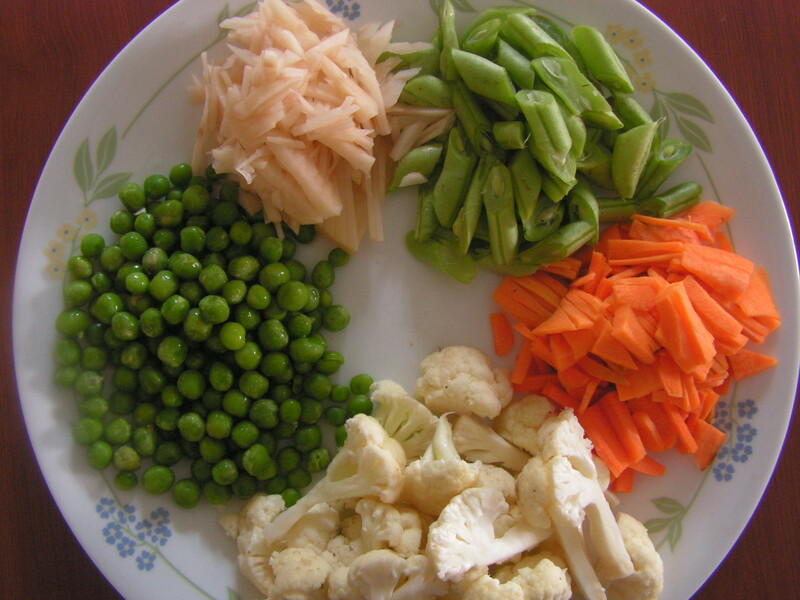 Wash and drain water from basumati rice and keep it aside on a plate so that it is dry and fine as shown in image-2. 2. Place a cooker with 1 tablespoon of cooking oil in it on medium flame. On heating add cumin seeds to it. 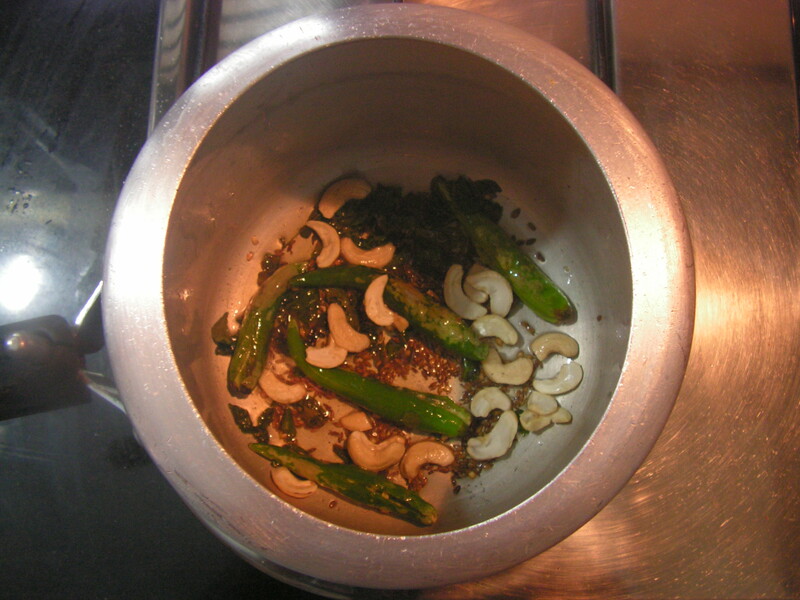 Once it splutters add slit green chili, curry leaves and cashews to it and fry till done. 3. When done, add chopped onion and required quantity of salt to it and fry till transparent. 6. Add required quantity of water and cook on simmering the flame for about 30 minutes. 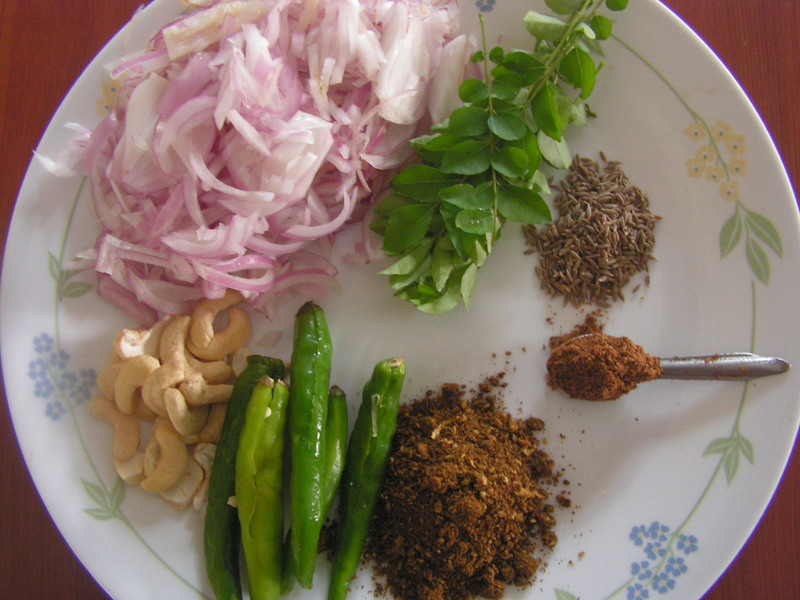 Ready to serve Masala bhath is as shown in the image below. Garnish it with chopped cilantro!!! 1. Basumati rice is best suited for this dish. 2. The dish can be cooked on high flame and then placed on a tawa for about 20 minutes for the dish to cook further. Of if you are used to cooking such items in the cooker itself on low flame then you can do that as well. 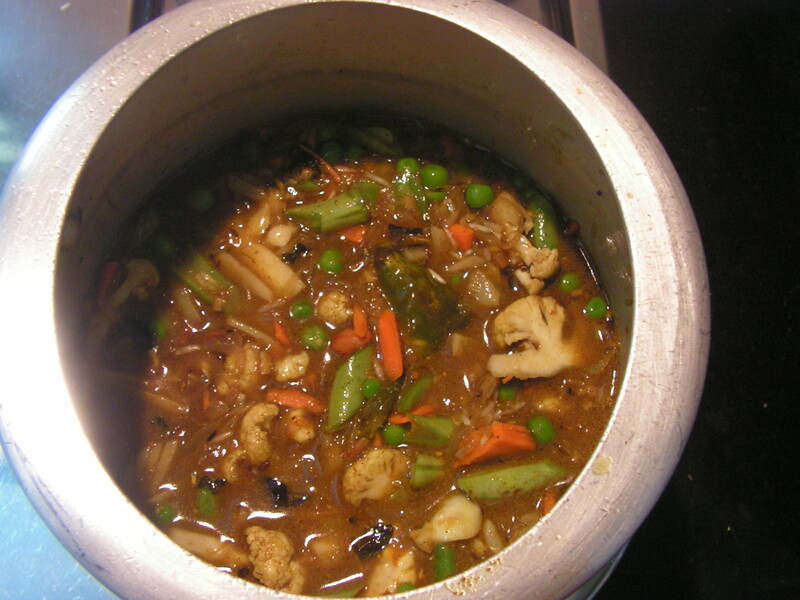 This entry was posted in Uncategorized and tagged Maharshtrian delight, One hour, One pot meals. This post was long over due on this blog and did not happen due to the non-availability of the particular variety of jackfruit. We have enjoyed this snack in our childhood days at my granny’s house as she pampered all her grandchildren making things all alone in that old kitchen with no modern amenities etc. and feeding us all. I thought of putting up this crispy today to add to the list of chips which I have already put up on this blog namely Banana chips and Sweet potato chips. This snack is very rarely prepared at home as it is a little laborious to chop the raw sheyaths of the rawjack – so prepare to work hard at this ! I took around 45 minutes to chop and barely 15 mins to fry and spice it up. In Konkani we call it Gharen Karo or Pansa balka ( in North Canara ). 1. Cut raw jackfruit and separate the pods and de-seed and chop it uniformly lengthwise and keep it aside. 3. When done it will turn crispy and a little light brownish yellow. The hissing sound should also have stopped. 4. Assuming you are not making the spicy/masala version, add salt water to it and just transfer it to a paper towel. 5. When chips is fried transfer it to a colander and add the masala powder. As usual adjust masala powder based on taste. Really yum and something unique. Enjoy it with a cup of coffee or tea. 1. This particular chips need a special type of Jack as mentioned in the introduction. An unsuitable version will turn out soggy rather than crispy. 2. Normally people prepare only salted flavor of the chips. I just gave a thought to make it a little spicy to have a different version of the same. This entry was posted in Uncategorized and tagged Fried snacks, Jack fruit recipes, One hour, snacks. Sprouted Moong/Greengram makes for a healthy meal – the sprouted part enriches its nutrition content. I generally use sprouted moong to make a healthy salad or dalithoy or a cool juice for this summer heat. I had actually soaked it to sprout to prepare a different dish but thought of just trying out a stuffed paratha and gave a twist to the stuffing by adding only black salt instead of the normal salt. My experiment was successful, and so thought of sharing it with my fellow bloggers. Here is my version of Moong paratha. I have already put up a few variety of stuffed parathas and this would be added to the long list of the same. 1. Soak moong overnight in water. Drain water and tie it in a clean cloth and keep it aside in a closed bowl for about 6-8 hours. It will sprout as is shown in image-1. 2. Pressure cook the moong, adding a pinch of salt. 4. When done, add all the powders as well as ginger-garlic paste and stir in for a while. 7. Pinch out required quantity of the dough, roll it to around 3-4″ diameter and place stuffing in it fold the corners in such a way that the stuffing is intact. 8. Roll it on a thick plastic sheet in such a way that the stuffing does not come out and is rolled evenly to required thickness. 9. Place a skillet with 1/2 Teaspoon cooking oil in it on low flame. When the tava/skillet is hot, place rolled paratha on it and fry it till done. Apply oil on top of the paratha too so that when flipped it will not burn black. 10. When done, flip and roast on the the reverse too. It fluffs up when roasted normally if rolled in a phased manner. 11. Enjoy with tomato sauce or any pickle of your choice or even with curds. 1. Moong should be cooked till smooth. 2. Do not water at all while cooking moong but cook on low flame only in the cooker. 3. Outer dough should be properly done so that one can roll it easily with the stuffing intact. 4. Always roast on medium flame to avoid it from getting burnt. 5. 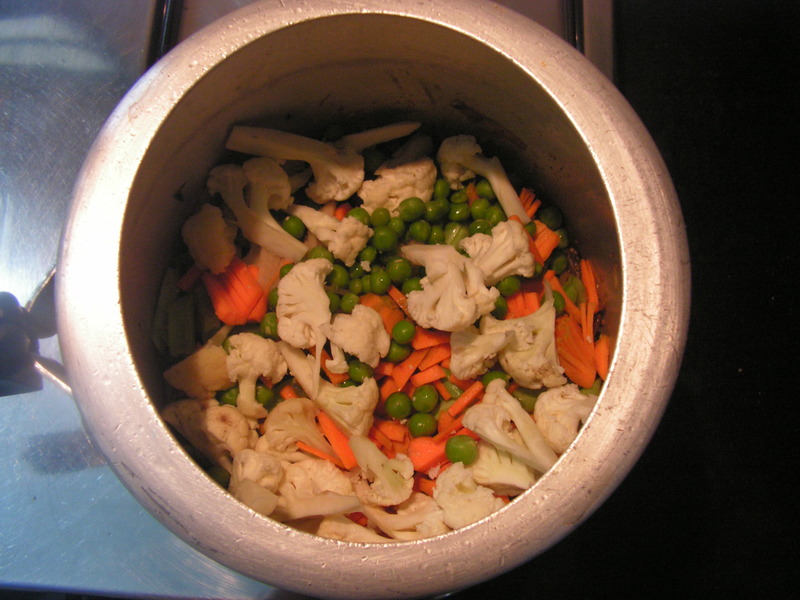 The stuffing can be prepared and stored in the refrigerator to prepare when needed. This entry was posted in Uncategorized and tagged Advance planning, One hour, Parathas and Rotis. My personal fascination with oats continues – from my own conscious caution about healthy eating and also spurred by the encouragement of many readers of this blog. I continue experimenting with oats – some past successes have been uploaded as oats appam, oats poha upma, oats upma, oats-chana dal laddoos, oats chiwda, oats roti, oats paratha, peanut-oats laddoos. Today’s recipe is also hopefully mindful of healthy eating – oats with dry-fruits, peanuts, and just about a teaspoon of pure ghee. There is no sugar or jaggery in this recipe, and all sweetness is rendered only by dates (which are healthy). Please do try out and hope relish it too!!!!!!!!!! 1. 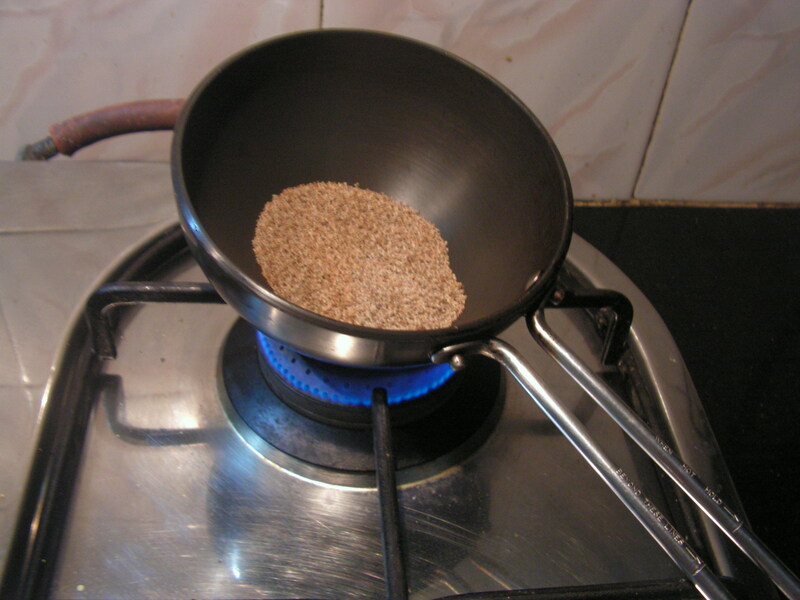 Place a wide skillet with Quaker oats (or any other brand) in it on low/medium flame and dry roast it till you get a nutty aroma. 2. Empty the skillet and dry roast peanuts until you’re able to peel the peanut skins off. 4. Pinch out required quantity of the mix and make them into round laddoos. 2. This laddoo may not be very sweet as neither sugar nor jaggery is used. The sweetness is only of the dates. So one can increase the quantity of dates to turn out a little sweeter. Pure ghee can be also added if needed. . This entry was posted in Uncategorized and tagged Festival food, Festivals, Laddoos, Oats recipes, One hour, Sweets. This makes for a sumptuous and delicious one-pot meal ! It is very popular among North Indians, and not that appreciated in the South – mostly because we don’t employ rajma in our ethnic dishes. However, I’m sure it’ll be appreciated if made at home, especially as a departure from the routine veg pulav or tomato/coconut/lemon rice. I’ve previously uploaded recipes for dal makhni and rajma, and essentially you can have these dishes served with rice. However, I have tried to make it as a one-pot meal and this is my version. Be advised that it requires some advanced planning. 1. Wash and drain the basmati rice and keep it aside as shown in image-1. Wash, peel and cut tomatoes fine. Peel and chop onions fine and keep it aside as shown in image-4. 2. Soak Rajma beans in water overnight. Drain water from it and tie it in a cotton cloth tightly and keep it aside till evening. By then it will have sprouted – however this happens only in the heat of the summer, and even so, the sprouting is not complete (as in image-2). 3. Grind the ingredients of wet masala in the mixer adding very little water if necessary to a thick consistency. 4. Place a cooker with 2-3 Teaspoons of cooking oil in it on medium flame. When hot, add cumin seeds to it. When it splutters, add chopped onions and a little salt to it. In the mean time add chopped tomato from step-1 also to it and keep stiring till it is fried well. When fried add grind wet masala to it. 5. Finally add all powders in a row and also the cumin powder and stir in well. 6. Finally add basmati rice and sprouted rajma beans from step-2 and step-2 to it and also add required quantity of salt and water to it and cook till done. 7. Enjoy with tomato onion salad or raita of your choice when done. 1. This requires advance planning – especially overnight soaking of rajma. 2. Rajma Beans when used in other dishes too should be soaked properly and cooked smooth through out on low flame in cooker till smooth..
3. The proportion of both cilantro and mint can be as per one’s palate. 4. 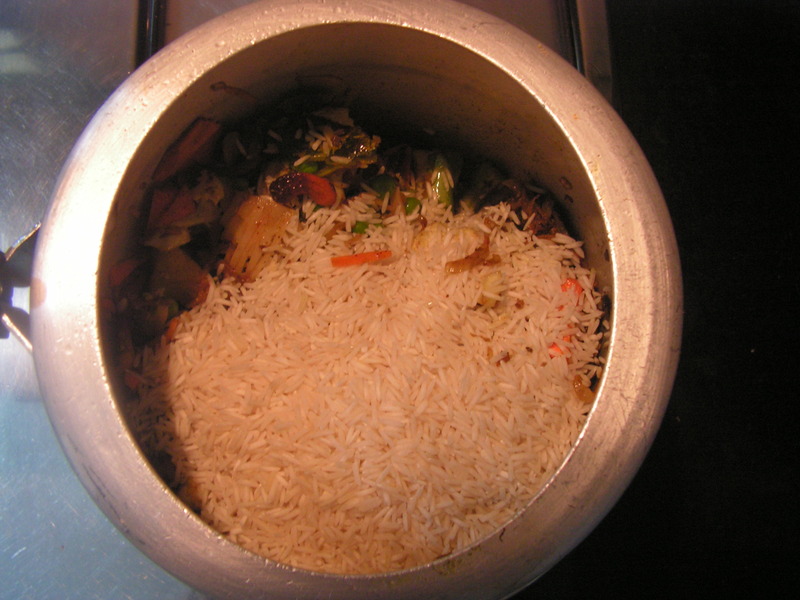 Cooked rice also can be used in place of rice being cooked with it. This entry was posted in Uncategorized and tagged Advance planning, North indian dishes, One hour, One pot meals. Papaya is a tropical fruit available throughout the year. The fruit has been ascribed many medicinal qualities, especially enhancing digestion, and nutritionally rich in Vitamin A, B and also C. Though not particularly liked by all, it is normally found in all Indian kitchens. The raw fruit is used in curries too. I just tried the Burfi with coconut in combination with dry fruits and it tasted as tasty as “Doodh peda” – so much so that my friends were surprised by how tasty it was. The incredible response was my incentive to share this recipe with you and add it to the list of burfis already uploaded on this blog (milk burfi, coconut burfi, peanut chikki/burfi, tomato burfi, besan burfi, maida-sujee burfi, seven cup burfi, almond burfi, sesame chikki-burfi, mixed atta burfi, kuvale khadi/ash-gourd burfi). 1. Peel and grate the papaya fruit and keep aside. Grate coconut and then grind the grated papaya and grated coconut and sugar in the mixer to a fine consistency. Peel cardamom and powder it too. Grate cashews, pista and keep aside. 3. When it starts thickening add milk powder and stir well. When it starts separating from/leaving the side of the skillet, add rest of the ghee and grated dry fruits and cardamom powder to it. The mixture will attain the consistency of chapati dough. 1. Use fresh and ripe papaya for the dish. 2. Time taken may differ as per the size of your burner. 3. Use any dry fruit of your choice except raisins. 4. I have used only 2 cups of chopped papaya and hence it took about 1 hour. It will take longer if you use greater amounts of ingredients. This entry was posted in Uncategorized and tagged Burfi, Festivals, Newbee, One hour, Sweets. Avalo (Konkani) /Nellikayi (Kannada) /Amla (Marathi) /Gooseberry (English) is known to us as the richest naturally available source of Vitamin C. I have previously uploaded recipes for avale saru and the popular nellikayi chithranna. The ingredients for avale hindoli are the same as for a pickle, but its texture makes it look more like a chutney. This pickled preserve has a shelf life of around 3 months when stored in refrigerator. I remember, in the days when we didn’t have a refrigerator, my mother-in-law would keep the bottle of pickle in the sun daily to enhance the shelf-life and flavour. This hindoli can be eaten with roti/chapati or dal rice or curd rice too. Let me know how it turned out ! 1. Use fresh big amla for this dish instead of the small variety available. 2. One can retain the consistency while serving or even dilute it while eating with a little boiled cool water, but do not store diluted version. 3. For best results, remember that one part of the masala ingredients are ground coarse and another part is grind a little more than coarse and finally mixed. Cooked Amla should be ground at on the whipper mode of the mixer. 4. Never store it at room temperature as it is sure to perish. 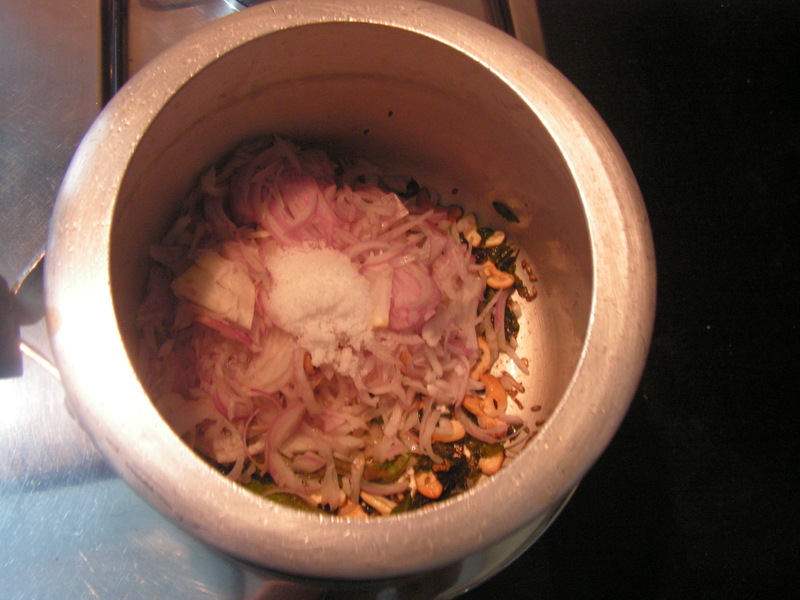 This entry was posted in Uncategorized and tagged Konkani dishes, One hour, Pickles, Summer food.